A few years ago I bought a set of pen blanks that were marketing by Woodcraft as being “African Pen Blanks” and since I have had a lifelong interest in Africa and all things African, this appealed to me. Included in the set of 32 pieces were two pieces labeled as “Nigerian Satinwood.” It was only years later, having used the blanks to make a custom order of stylus pens for Christmas gifts, that I researched the wood and discovered some interesting controversy surrounding its naming. What was sold to me as “Nigerian Satinwood” is more commonly known among woodworkers as Movingui and it is that name that I will use from here forward. Of course, the tree from which this wood is harvested has a much different scientific name; in this case it is Distemonanthus benthamianus. As part of searching for more information about this wood, I discovered that several tropical hardwoods have been given the moniker “satinwood,” usually by vendors but not usually by wood workers and certainly not by botanists. In general, anytime I encounter a wood that has a qualifier, usually a geographic region such as “African” or “Nigerian” in this case, I suspect that the wood isn’t entirely true to the description being used to sell it to me. The case of Movingui proves to be no exception. There are several different woods commonly sold as variants of “satinwood” through the use of the following geographic qualifiers: Asian, Ceylon, East Indian, West Indian, and Nigerian. Asian Satinwood is properly known as Lagerstroemia spp. (Pyinma or Crepe Myrtle are common names), Ceylon and East Indian Satinwoods are both properly known as Chloroxylon swietenia, finally West Indian Satinwood is properly known as Zanthoxylum flavum. You will note that none of these woods come from the same genus although they share common names. Understandably this can create confusion amongst wood buyers who might never be certain exactly what wood they are actually purchasing and it might matter since the characteristics of these woods can vary and it is also even possible that some wood workers would have serious allergic reactions to one species of so-called “satinwood” but not another. In the end, it might be strictly academic, or of interest to a limited number of non-academic wood workers, but I find these confusions of great interest. At least one expert strongly believes that only the West and East Indian varieties should truly be referred to as Satinwoods, based on a number of different criteria, which you can read about in detail here. At least his two candidates, while not in the same genera, do at least share a botanical family, the Rutaceae. The other characteristics he considers important are easily found in the above linkage. Turns out that Movingui, along with Pyinma and Yellowheart (Brazilian Satinwood, properly known as Euxylophora paraensis), are woods that this one expert refers to as “satinwood imposters.” That doesn’t make them bad woods per se, but they don’t meet at least some definitions of a true satinwood. Read the details for yourself to determine if it matters to you personally or not, but at least we know now what, exactly, we are dealing with when confronted with at least the Nigerian version of satinwood. Woodcraft was correct that this wood comes from Africa, western Africa to be exact, and it grows in a band stretching down from roughly Sierra Leone in the north to as far south as Gabon and Congo. It is a very important timber export wood for countries such as Côte d’Ivoire, Ghana, Cameroon, Gabon and Congo, usually in the top ten species exported by volume each year. Very detailed technical information, including export volumes, can be found on the PROTA4U website. Movingui is a reasonably hard wood, scoring about the same as White Oak on the Janka Hardness Scale. The wood is also fairly dense, and measures in as one of the densest of all tropical hardwoods that one will commonly encounter. In terms of coloration, Movingui tends to be yellow to orange-brown and this color, as is common with many colored woods both tropical and domestic, will darken with age. There is not a great deal that be done to completely prevent this sort of color change as it is due to exposure to oxygen in the air which reacts and combines with colored chemicals naturally in wood, but the use of ultraviolet light inhibiting finishes and keeping pieces made from woods that darken with age out of direct sunlight or artificial light will at least help to slow the process. The grain of Movingui is described as being anything from straight to inter-locked to wavy, so any one piece can be quite distinct from another with no consistency to be expected. Fortunately for makers of veneer and fine furniture, Movingui frequently exhibits figured grain patterns such as mottle or ripple. When these occur, the value of the timber will increase, potentially exponentially, over plain pieces. Excellent photographic examples of the appearance of Movingui, including pieces with high figure, are available here. Movingui texture is reported to be fine and even, with a naturally high luster. Luster of this sort in wood is often the result of naturally occurring oils, resins, or even gums, and while that helps to create a beautiful naturally polished finish, it can create problems with everything from gluing to the application of artificial finishes. The presence of these natural materials can also affect sanding and cutting operations as well. Movingui end grain is reported to be diffuse and porous without specific arrangement or pattern. Movingui is considered to be at least moderately durable in terms of resisting rot and decay, although the sapwood is less resilient than the heartwood. Movingui is also moderately resistant to termite attack. In general, Movingui is considered an easy to work with wood, although this statement comes with a wealth of provisos! Movingui can have very significant silica deposits, up to 1.3% by weight, and while this number sounds low, percentages as low as < 0.1% can be considered high, so the silica content of Movingui can be considered enormous. The result of this silica content is a blunting effect on cutting tools that is at least moderate and sometimes severe. Therefore, very frequent sharpening of tools will be a necessity when working with Movingui unless one is using tools with replaceable carbide cutters such as are used in the Easy Wood Tool system. Such tools eliminate the need for the time and expense associated with sharpening. Carbide and tungsten tipped tools are the best bet for wood with silica content this high, if using tools that do not have replaceable bits. There are also reports of saw blades over-heating and burning due to the incredibly high silica content as well as due to the presence of natural gums in the green wood. Use caution during cutting and ensure that blades are as sharp as possible to help prevent these problems. If the Movingui being worked with is highly figured, quarter sawn, as well as other, surfaces may be inclined towards tear-out during planing. Again, caution is generally rewarded and some experts recommend angling planer blades to between 15 and 20 degrees to help reduce the risk of tear-out, although I cannot personally attest to value of this recommendation. The wood may also split or even char, again due to silica deposits during drilling, so, again, use caution and patience. Pre-drilling small pilot holes will help reduce both the incidence of splitting and charring. Finally, on the good side of the equation, Movingui does glue, stain, and finish quite well, and if needed, it also responds moderately well to steam bending. There is a slightly detectable odor, for some people, when working with Movingui. Movingui is most commonly available as a veneer and it will command a price in the middle to upper ranges for a tropical hardwood. Whenever a high degree of figure is present, prices will be higher, potentially significantly so. I was not able to locate a wood retailer offering Movingui at this time so I cannot quote a specific price. In searching, it is important to remember to use common names such as Nigerian Satinwood or Ayan, as well as considering alternative spellings such as Movingue. 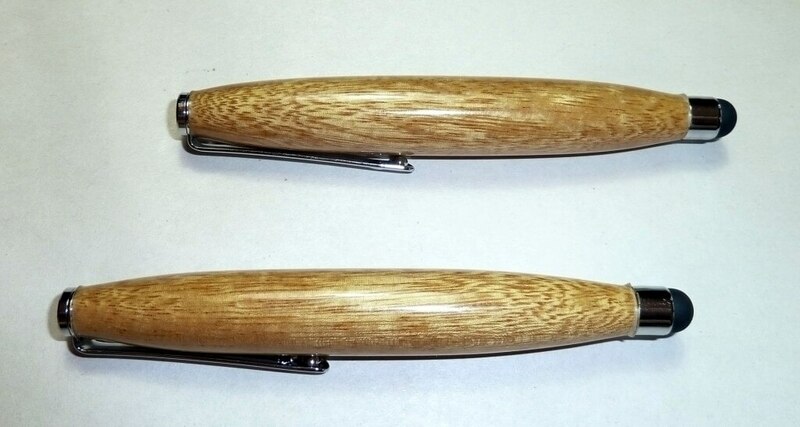 Woodfinder is an excellent website that is dedicated to advertising exotic wood dealers. In your search for wood, this can be an invaluable resource provided you use multiple search terms to capture all the possible listings. I can’t speak to the quality of any of the listed dealers, but Woodfinder does have the advantage of allowing searches to be performed based on location which might allow an interested buyer to visit a listed wood dealer in person to hand pick pieces at a comfortable price. Although they do not stock Movingui at this time, I always recommend both West Penn Hardwoods and Bell Forest Products as excellent sources of both domestic and exotic hardwoods. I have had multiple dealings with both vendors and have always been very satisfied. The most common use of Movingui, and the form one is most likely to find it, is as a veneer. Other decorative uses include, but are most certainly not limited to: cabinetry, furniture, and flooring. In its native areas, it has been used as a utility wood for railroad ties and construction. I have also read references to the use of Movingui as a tonewood for musical instrument construction, usually guitars, in which it provides a “brighter” tone. As sometimes is the case with tropical woods, Movingui finds many uses in traditional African medicine in the areas in which it is endemic. Pounded Movingui bark is applied to skin complaints including furuncles and abscesses. The bark has also been reportedly used as a treatment for epilepsy, palpitations, and even used as an enema supposed to treat hepatitis. The bark may also be used in the form of baths or steam inhalation for the treatment of various conditions including bronchitis, rheumatism, and fever including malaria. In addition to medical uses, some people use the twigs as chewing sticks to clean teeth. And finally, a yellow dye that can be made from the roots has been used for body decoration. Westerners may be inclined to scoff at the use of wood and bark as medicine, but western scientists are actually in the process of investigating the efficacy of Distemonanthus against both bacteria and fungi. More specifically, work is underway to determine if extracts and derivatives from Distemonanthus can be used effectively as otherwise non-toxic applications to prevent mold deterioration of stored timber. Stayed tuned for additional research information as it becomes available, and perhaps those of us inclined to disregard more “traditional” medicines should realize that sometimes there is something quite real at work. Movingui is not listed with either the Convention in International Trade in Endangered Species of Wild Fauna and Flora (CITES) Appendices or the International Union for Conservation of Nature (IUCN) as being threatened or endangered. Personally, I believe that regardless whether a species is listed by conservation agencies or not, conservation and good forestry practices should be of overall concern when working with or purchasing any species. It realize that most wood workers do not have endangered species lists memorized, therefore I think it worthwhile and important to do even a small amount of research before purchased any lumber, domestic as well as imported, to be certain of the potential impact you are having, even in a small way, on threatened or endangered populations. This information is easy to come by and takes only minutes to locate through any Internet search engine. You simply cannot count on a vendor to tell you a product they are selling is endangered! Although severe reactions are quite uncommon, Movingui has been reported to cause skin irritation. Appropriate protective equipment is therefore recommended, as always, when working with this, or any other, exotic woods, unless you have worked with the species before and are certain you are not sensitive to it. However, given the potential uncertainty about identification, especially if the wood was purchased only as “satinwood” it is possible that one sample might be quite different from another even if labeled the same, and caution is almost always rewarded. Complete information about health hazards associated with a wide variety of exotic hardwoods is available from The Wood Database. Additional information about how to best use a dust collection system and personal protective equipment, such as respirators, can also be found through this excellent and comprehensive resource. Fortunately, I have experienced no negative side effects when working with the small pieces of Movingui that were a part of my pen blank set. As I have noted, my experience working with Movingui was limited to two small pen blank sized pieces. It may be worth noting that while this kit is still sold through Woodcraft, it no longer appears to contain Movingui, although the vendor notes that the actual woods may vary as stock changes. However, given my limited exposure, I found Movingui to be moderately hard. I thought the grain was rather open with noticeable porosity. My pieces cut roughly at first but sanded quite smooth with ease. I didn’t note any oil present, which is quite easy to detect on both sandpaper and sanding screens, such as Abranet, as oils will gum up both of these materials quite quickly. I also didn’t notice any scent despite reports that there is a slight scent present. Probably because my pieces were so small, I didn’t notice any significant blunting or dulling of my turning tools, but I can easily believe this would be an issue in larger pieces. I came away rather neutral about my experiences with Movingui, which I knew at the time as Nigerian Satinwood. I didn’t hate it but I wasn’t wowed by it either. Given its seeming rarity in this country it seems unlikely that I will work with it again and I don’t suspect I will lose sleep over that fact. However, if you can find pieces of it and you want to work with it, I can’t think of a single reason you shouldn’t, so have a good day’s turn!